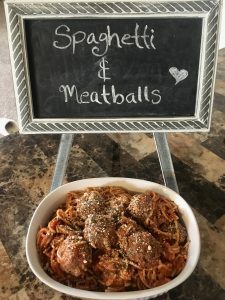 Who didn’t grow up eating spaghetti and meatballs? I know I did but my mom always added some Middle Eastern spices in there to make it her own. Well, I decided to make my own twist on this classic. I used brown rice pasta instead of white-a little healthier that way. I try to cut corners wherever I can. I used vegan mozzarella cheese instead of dairy-also better for you. 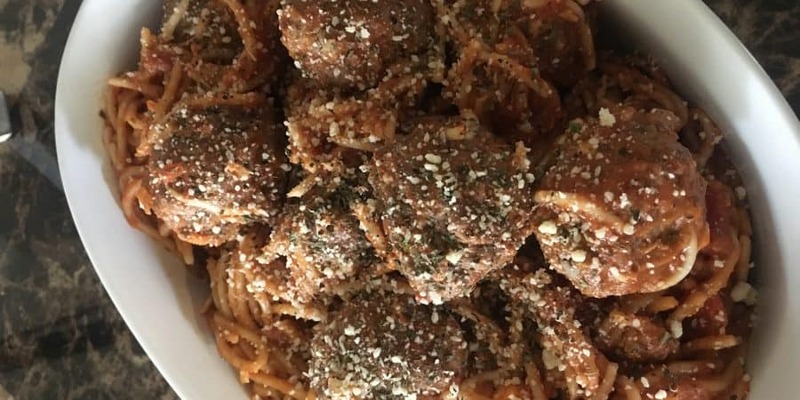 The meatballs you will see also aren’t as heavy as your average meatballs concoction. This still is a hearty meal with a great amount of flavor. You will see! Brown rice Spaghetti or whatever spaghetti you have at home would do! First, we want to prepare the meatballs. To save some time, the night before I took out my handy processor and cut up 1/2 a yellow onion, a handful of cilantro, 3 cloves of garlic, salt, and pepper and drizzled olive oil into the mix. Process it all till it’s nice and fine; it’s okay to have some chunks. Take out your ground beef and place in a bowl; pour 1/2 a cup of breadcrumbs into the beef as well as the ketchup and mustard. Also, the mixture made in step 1; pour it into the beef concoction. Make sure to add salt and pepper. 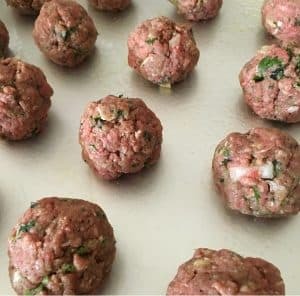 Preheat oven to 400 degrees and place the meatballs on a pan that is sprayed with olive oil-so your meatballs don’t stick. You will bake the meatballs for 20 minutes- you should notice them becoming golden brown by this point. Take it out of the oven and set to the side. Take out a large pot and bring water to a boil. In my pasta water; I drizzle in olive oil, salt, and pepper. Add the spaghetti to the pot once the water is boiled. Make sure the spaghetti is completely covered with the boiling water. Pasta should take about 10 minutes to cook. Take out the pasta and drain it. Place drained pasta back in the pot and add the meatballs to it. Now let’s get working on our sauce! Use all jar of red sauce and pour it on top of the spaghetti and meatballs. Add the pesto sauce, parmesan cheese, handful of mozzarella cheese, 1/2 a chipotle pepper diced up finely, garlic powder, and salt & pepper of course. Always salt and pepper your food! 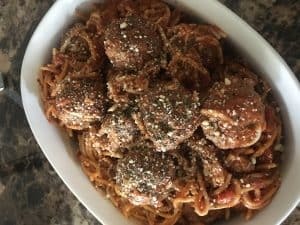 Mix everything together evenly; till the pasta and meatballs are coated with the sauce. You are done! This looks so amazing and super healthy!! Pasta has always been one of my favorite dishes to make, but I avoid it due to the carbs. I haven’t cooked with brown rice pasta yet. I am looking forward to trying it out. Thank you! Awesome, cant wait for you to try it. I bought the brown rice pasta from Aldi in case you don’t find it else where 🙂 You are welcome. Previous Post Linzer cookies – Easiest cookie you will make! Next Post Sautéed Zucchini & Mushrooms – Finger lickin’ good!